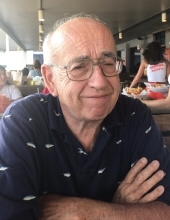 Ronald Lee "Ron" Townsend, 78, of Atlanta, beloved husband, father, grandfather and friend, passed away Wednesday, January 23, 2019. Born July 25, 1940, in Eustis, Florida, he was the son of the late Wendell and Helena Sturdivant Townsend. Ron graduated with a Bachelor of Business Administration and went on to join his father's company, Townsend Roofing Company. He was a longtime member and deacon of Clairmont Hills Baptist Church, now Bridgepoint Church at Toco Hills, and was a staple in the community. Ron was a past president of the Roofer Association of GA and the Georgia Region Model A Restorer Club. He was an avid fisherman and master artist in stained glass with works in churches here and abroad. He was also a collector of antique fishing lures and Model A Fords. Ron is survived by his wife of 55 years, Sandra Speer Townsend; son, Chris Townsend and his wife, Tara; daughters, Rhonda Hughes and her husband, Jack, and Tiffany Tabor and her husband, Jamie; five grandsons: Austin Mullinax, Ander Mullinax, Garston Townsend, Henry Townsend and Garrett Tabor; granddaughter, Audrey Tabor; brother, Lewis Townsend and his wife, Naomi; sister, Wendie Primm and her husband, Rick; nieces, nephews, and many more loving family and friends. In lieu of flowers, donations may be made to the church or a charity of your choice. The family will receive friends from 4:00 p.m. - 6:00 p.m. Saturday, January 26, at A.S. Turner & Sons Funeral Home. Services will be held at 2:30 p.m. Sunday, January 27, at Bridgepoint Church at Toco Hills, with Reverends Jim Haskell and Larry Burgess officiating. Interment will follow services at Floral Hills Memory Gardens, Tucker, GA.
To send flowers or a remembrance gift to the family of Ronald Lee Townsend, please visit our Tribute Store. "Email Address" would like to share the life celebration of Ronald Lee Townsend. Click on the "link" to go to share a favorite memory or leave a condolence message for the family.